I have to admit that I didn't recognize Tadashi Shoji's name when I read the press release for his first fragrance release. After a quick bit of research, I learned that he's a Japanese fashion designer best known for his special-occasion dresses. His designs have gained an ardent following of women who love their floral prints, embroidery and other embellishments, and figure-flattering cuts, and you may have seen some of his dresses worn by such prominent women as Michelle Obama (multiple times), Octavia Spencer (for her 2012 Academy Awards win), Katy Perry, Christina Hendricks and Paris Jackson (yes, Michael Jackson's daughter). Eau de Rose was developed for Shoji by consultant Ruth Sutcliffe with perfumers Jacques Chabert and Nathalie Koobus, and it was reportedly inspired by Japanese gardens and Shoji’s love of roses: “When I smell rose, it’s calming and makes me feel so happy. "1 It has top notes of bergamot, lemon, mandarin, grapefuit, rhubarb and blackcurrant; heart notes of rose, jasmine, osmanthus, lily of the valley and cedarwood; and base notes of musk, frankincense, patchouli, rose and oud. I try to sample as many new rose scents as I can, since rose has become something of a scent specialization for me; sometimes I'm disappointed, and sometimes I'm able to add a new recommendation to my list. I like Tadashi Shoji's addition to the rose genre: it's not your average pink-tinted peony scent masquerading as a rose perfume, and it feels like something made for adult women. It starts off with a distinctive tart rhubarb note. (If you have fond memories of Comme des Garçons Series 2 Red: Rose, you might enjoy Eau de Rose's top notes.) It's not just a fruity rose, either, though: it has an intriguing edge, something aromatic and almost minty, yet dark. The rose in the heart of Eau de Rose is wine-y and a touch jammy, and the tanginess of the rhubarb and other red fruit notes keeps it from turning too sweet. For a while it reminds me of Keiko Mecheri Damascena, an old favorite of mine from the early 2000s, but tonally it continues to deepen. Its base is lush, with waves of incense and wood under the rose and that mysterious aromatic note (something to do with the oud?). Eau de Rose is a "dressy" rose fragrance, with too much sillage and drama for the office. Instead, it would be just right for a cocktail party or some other evening out (worn with one of Shoji's dresses?). I'm always happy to come across new rose fragrances with presence, from Atelier Cologne Rose Anonyme to Elizabeth and James Nirvana Rose to this one. My only question is why it was given the somewhat dull name of Eau de Rose. It deserves something with a little more texture, maybe even with an allusion to dressmaking — Brocade Rose? Rose Illusion? In any case, if you're a rose-lover, and you do come across this fragrance, stop to smell it. 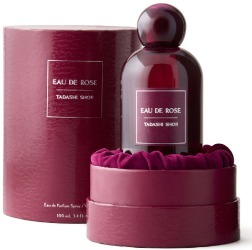 Tadashi Shoji Eau de Rose is available as 50 ($110) and 100 ($135) ml Eau de Parfum. A 9 ml rollerball ($27) and matching body cream are also offered. Available at Macy's, Lord & Taylor and the brand website. 1. Allison Collins, "Tadashi Shoji Launches First Fragrance," Women's Wear Daily, March 1, 2017. Hey, you’ve got my interest! I also didn’t know of this brand and have to agree that the name is not intriguing, but your review has made me want to seek this out for a sniff at least. Maybe the name sounds more exotic to Japanese ears, who don’t get so many Eau de Whatever releases? I too am intrigued and would like to sniff this. I found it on the website, but it is 2017 Fall collection, so they are being coy about availability and price. Many pretty things, but I am afraid I am falling victim to the “Well, I could make that!” trap. Too many years in 4-H sewing and Make it Yourself with Wool competitions…when of course the problem is finding the fabrics….but, very pretty things. Yes, and no apologies needed!! I would love to have that coat, too!! 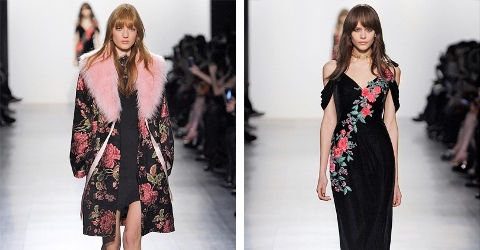 or any black floral coat with a pink furry collar. Yeah, I want the coat, too. Even though my city is tropical and sunny. Fake pink fur is so underrated, there should be more of it overall. It’seems just delightful to find so many like minded people here! I rather strongly disagree that his dresses are figure flattering At least they sure don’t flatter my figure. Now maybe if I were a foot taller and several sizes thinner…..
lol. Same here, for those specific designs, at least. Apparently he’s known for doing custom designs for women with a wide range of sizes and shapes — not just 100-pound starlets! I actually like a few of his designs very much, and now I want to keep an eye out for sales!! Thanks for the review, Jessica! Since I like rose perfumes on the darker side, this sounds rather interesting. I will try my best to sniff it out. I do like some light rose scents, like the Grace Coddington / Comme des Garcons collab, or Rosine’s Diabolo Rose, but in fall and winter I like my roses dark and spicy! I *really* like some of their dresses, but never would have paid any attention to their scent. You’ve inspired me now, though! Now that I look back, I realize I’ve seen his designs on Michelle Obama (in photos) several times! — and they were all lovely. Sounds lovely! I’ll be watching for that 9-ml rollerball. I really appreciate the fact that they’re offering a smaller size! and this EdP is pretty potent, so even the rollerball will go a long way. Nice review, Jessica. I have become quite fond of rose – scented fragrances recently and have collected some nice ones. This one seems like one I would like to try. Yes, it’s true, the bottle isn’t visually stimulating, but maybe they were going for a “less is more” look. If what’s in the bottle is good, I don’t mind that the outside is not. It’s what’s in it that matters to me . But, a beautiful bottle is always a bonus! Can’t wait to try this. Very true! A fantastic bottle design can’t save a lackluster fragrance. Actually, I think it’s smarter that they/he went simple here, rather than trying to make something that looked like one of his dress prints, which would inevitably have looked really tacky in bottle form! I always associate Tadashi Shoji with Octavia Spencer, since he’s been responsible for her best red-carpet looks over the past five years or so. I like his designs and will give his new scent a sniff if I run across it! I suspect that mysterious dark note is indeed the oud. As soon as you said “minty,” I reread the note list to see if oud was in there. You know that’s how the oud in Jo Malone Rose Water and Vanilla comes across, too — as a suggestion of something minty. N, I thought of you and your Rose Water and Vanilla experience when I was sniffing this!! I’m glad you remember that experience so I know I wasn’t imagining what you told me. I like his designs, too. If I were ever in the market for a custom-made red-carpet gown (haahahahah), I’d give him a ring. Looks like the company went straight to the mainstream distribution channel! With all the yucky slush, I had been taking the subway and have not been to sniff at Macy’s. You’ve inspired me to stop in at Herald Square tomorrow. I have to bring in my Longchamps tote to be repaired anyway – there’s a hole in each corner and the zipper is stuck about 7/8 of the way through. The best thing? The repair is free; I think they ask for $25 for shipping and handling which is nothing considering these bags last a long time. I’ve used mine since 2013 and it had travelled with me on 85 days of vacation over the past 4 years plus the daily commute to NYC. If you’re going to be in Herald Square, you might as well do some sniffing!! Good luck with the bag repair! Jammy/winey rose with rhubarb that lasts, is widely available AND comes in a smaller size?! On my radar! Great review. This sounds very interesting. Love that they have a rollerball in the line up. I’ve heard of this designer, I believe few years back they came out with a plus size line of clothing which was a pretty big deal at the time. Yes! He does offer a plus-size collection. He’s been quoted as saying things like ““I design to make women feel confident and beautiful” and “I do not discriminate about size. I design dresses to accentuate a woman’s positives, whether you are a size 0 or a size 3X.” Very refreshing. Thank you for the review, Jessica! After reading Robin’s post and seeing that it comes in a rollerball, I hoped it would be a rose scent worth seeking out–so I’m glad to hear a favorable assessment. Yes, I was pleasantly surprised! There are so many boooooring rose fragrances (and more to come this spring, from what I can tell)… but this isn’t one of those watery pink things, fortunately. “RBW” is the new “FBW”!! Sounds like Tadashi Shoji knew who the target audience of his evening dresses was, when he decided to create a perfume. I am familiar with his clothing line, because the gowns are quite popular amongst older women, where I live. My mother actually wore a pink, lace Tadashi Shoji gown, to my sister’s wedding. Any designer who acknowledges the existence (and taste) of women over 25 is okay in my book! It is encouraging to be able to find something, to wear to your son or daughter’s wedding, that isn’t cut down to THERE? and up to THERE! ???? His designs are a refreshing change- tasteful and attractive. I’m looking forward to trying the scent. Just got a decant of this from Scentbird. Lovely and very off-trend. This is what I remember Stella smelling like 12 years ago, the last time I tested it. However my coworkers reviled the top notes! One asked if someone sprayed Raid nearby. Guess I’ll be wearing this on the weekends. Oh, I’m glad to know this one is getting some circulation out there! Now that you mention it, I agree… it has that ambery-rose feel that Stella originally had. It’s not trying to be a fruity rose or a fresh rose at all…it’s not afraid to be more full-bodied!